The footage was captured by a chase plane monitoring the landing attempt. 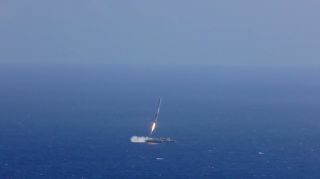 SpaceX released the video on Wednesday (April 15), one day after the company unveiled a greenier, grainier and shorter version that stopped just when the rocket stage was about to topple over and explode. Tuesday's attempt marked SpaceX's second rocket-landing near-miss in the last three months: A Falcon 9 first stage also exploded on the deck of the drone ship, which is named "Just Read the Instructions" after a vessel in the novels of sci-fi author Iain M. Banks, during the last Dragon launch, on Jan. 10. The tests are part of SpaceX's effort to develop fully and rapidly reusable rockets. Such technology would dramatically cut the cost of spaceflight, SpaceX founder and CEO Elon Musk has said. The touchdowns won't always be on "Just Read the Instructions" or another floating platform; SpaceX eventually aims to return its rockets to Earth on land near their launch site, so they can be reflown quickly and efficiently.